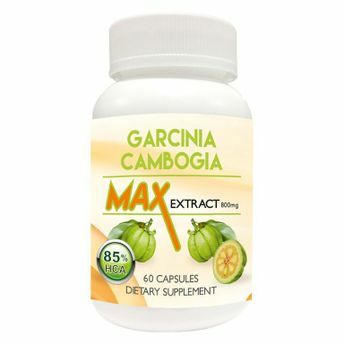 Garcinia Cambogia Extract 85% HCA MAX Natural Healthy Weight Management In A Bottle (highest quality/ concentration available on Amazon.in) - Imagine feeling completely full after only a few bites or eliminating unwanted cravings. Our proprietary formula is scientifically proven to reduce hunger pangs without changing daily routine significantly. 100% Natural Garcinia Cambogia MAX extract featuring the Dr. Oz recommended 85% HCA and Calcium and Potassium for optimum efficiency. 85% HCA is the highest potency Garcinia MAX ever anywhere and the highest daily dose formula is a great value - These 60 tablets maximum dose product is a high end premium product, every other Garcinia MAX out there has a lower HCA percent than we do. It features 60 vegetarian capsules of 800mg each, most competitors only have 400 to 500mg per capsules which would require you to take double the amount of capsules per serving. Garcinia is clinically proven to suppress appetite, halts body fat from producing, increases better metabolism by 2 times more than diet and exercise alone and promotes healthy serotonin levels and energy. You don't have to starve yourself to manage weight - Imagine eating only a few bites and feeling completely full or by dinner time not feeling hungry at all, It eliminates those powerful cravings that you just couldn't resist in the past. Trusted and used by top indian athletes, cricketers and bollywood stars to maintain their high intensity busy lifestyle.